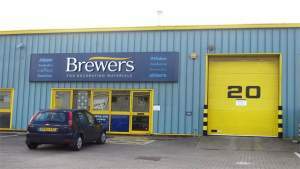 At Brewers Decorator Centre in Tonbridge you’ll find more than 70 years of experience among our close-knit team of three. We opened our branch back in 1995 and have built up a loyal customer base of local tradespeople, who value our expertise and excellent service. They’re always happy to send homeowners in to evaluate the large paint and wallpaper selection we carry in stock. Of course, we can also order into store anything from the Brewers selection and, where possible, more unusual items. We’re near Southern Water Sewerage Farm – but the air smells fresh, so don’t let that put you off! The showroom is on the Orchard Business Centre, directly off the A26 Sanderson Way opposite the Jeep/Chrysler dealership. There’s plenty of customer parking outside and disabled customers can access the shop via the delivery entrance. Travelling southbound on the A26 Vale Road, turn left on to Sanderson Way. From the A26 Woodgate Way, at the roundabout take the second exit on to the A26 Vale Road. Follow the road round to the left and take the right turn on to Sanderson Way. On Sanderson Way, continue to the end of the road. At the end of Sanderson Way, turn right and the store is on the right.